Game of Thrones mania is in full swing now that Game of Thrones season 8 is bringing HBO's grand fantasy saga to a close, and the wait between new episodes each week might seem unbearable. Perhaps you're like some members of our staff, convinced that Daenerys is the person who will win Game of Thrones, and you're eager to see the Targaryen queen sit on the Iron Throne. 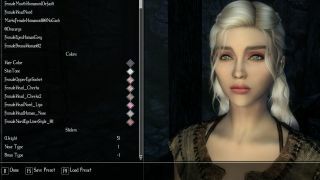 If so, why not download a mod that lets you play as Daenerys in The Elder Scrolls: Skyrim? Let me preempt any pedants out there: this mod by Shiva182 is by no means new, but people are always ready for more ways to enjoy Game of Thrones and/or Skyrim, and this is the quickest way you can make your protagonist look exactly like Emilia Clarke. The 'Daenerys as a RaceMenu Preset' mod does exactly what it says, making Khaleesi an easily-selected preset for all four human races without the need to fiddle around with each aspect of face customization. You can even choose from one of three hairstyles, depending on which season of the show you want to capture. The appearance of this virtual Dany avatar captures Clarke's doe-eyed serenity that belies inner strength, and that alone might be reason enough to drop another hundred or so hours into Skyrim all over again. The best Skyrim mods wring even more hours of enjoyment out of a game that's already one of the richest, most ubiquitous RPGs of our time, which you can replay constantly while we all wait with bated breath for more information on Elder Scrolls 6. Just don't go around killing dragons left and right as Daenerys, or you might never be able to forgive yourself. We've got plenty of Game of Thrones theories for how it'll all end, though "in Skyrim" might be the twist no one sees coming.